Find My Workspace lists over 95% of the business centres market in Shoeburyness. Simply click Request Quote to check pricing for one office, or Add to Basket for multiple offices. 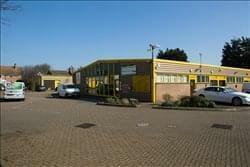 A modern development of small functional start-up business units over a two-acre site. The buildings can be used for a variety of uses such as offices, workshops, studios or warehouses. Services include reception for visitors, deliveries and dispatches, security patrols and first-class access for loading.